Lydia White teaches the reader how to kick the chaos out of their castle and turn it into a peaceful palace at last. 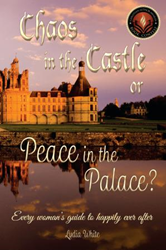 Lydia White’s new book, Chaos in the Castle or Peace in the Palace? - Every Woman's Guide to Happily Ever After, ($16.99, paperback, 9781498452489; $8.99, e-book, 9781498452496) is an enlightening read addressing important questions about the framework of love relationships and marriage covenants. Whether you are longing to marry, are planning a wedding, are living together, or have been married for many years this book gives insight on building the foundations for a peaceful palace versus a war-torn castle using the covenants of old to secure your happily ever after for a lifetime. This book – the 1st Place Winner in the Marriage Category of the 2015 Christian Author’s Awards – thoroughly describes what it means to be a wife, mother, and queen of your palace. The author addresses the history of covenants, the meaning of traditions in the marriage ceremony, and the amazing roles men and women were designed to play. It provides readers with knowledge on issues including building strong character, healthy communication and sexuality, as well as deciding the best time to have children. Embracing God’s unique design in covenant marriage enables women to kick the chaos out of their lives and move into a peaceful palace at last. Lydia White is a passionate blogger at http://www.livinginnobility.com – created to encourage women in their identity. Lydia serves on the board of Simple Faith Ministries, which she and her husband Dan created in 1995. From their first appearance on a marriage ministry platform for LifeWay Christian Resources, they realized this was their life’s purpose. Since then, they’ve served in different forms of marriage ministry from the local church to the big stage. Together they do premarital coaching for engaged couples. As a devoted married couple for 25+ years, they long to see the next generation of marriages built on solid principles that promote love that will last for a lifetime. Lydia White is also a women’s ministerial counselor for women in crisis and a women’s health and wellness educator. She holds college degrees in public relations and health education – and is a graduate of CLASSEMINARS, Inc., in Christian Leadership and Public Speaking. Xulon Press, a division of Salem Media Group, is the world’s largest Christian self-publisher, with more than 15,000 titles published to date. Retailers may order Chaos in the Castle or Peace in the Palace? - Every Woman's Guide to Happily Ever After through Ingram Book Company and/or Spring Arbor Book Distributors. The book is available online through xulonpress.com/bookstore, amazon.com, and barnesandnoble.com.